*This app is no longer being offered as FREE. This amazing virtual gallery boasts the largest collection Van Gogh artwork in the App Store. Budding artists will appreciate offline features and keyword search of almost 1000 images. Welcome to the 2.0 version of Van Gogh app. We have redesigned the app to provide you with a better experience in fine art. ★★ Welcome to the LARGEST collection of HD Vincent van Gogh’s Work ever in App Store, almost 1000 pieces of masterpieces, with high resolution which allows you to explore the very detail of Van Gogh’s work. 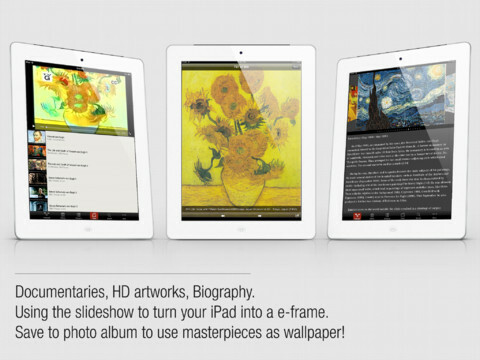 This app is a virtual gallery with complete collection of HD artworks (drawings & paintings) by Van Gogh. ★ the largest collection of Van Gogh’s work on the App Store, browse through the collection without internet/wifi/3G connection. ✳ Paris (1886–1888): Van Gogh moved to Paris and discovered the French Impressionists. Question, my iTunes says this app is 99 cents. I have no problem paying it, but is it free somewhere? Hi Eva, thanks for checking out our site. Unfortunately the app is no longer free, although it was at the time we wrote the app. That’s our mistake – sorry!